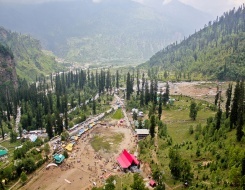 Kinnaur is the most fascinating region of the Indian Himalayas where the ancient tales and legends have gone to a greater extent of placing the people of Kinnaur--The Kinners. This is the land of fairy tales and fantasies bringing spectacular terrains of lush green valleys, orchards, vineyards snow-clad peaks and cold desert mountains. The district of Himachal Pradesh, Kinnaur is set within the Greater Himalayan belt and boasts of the highest mountains in Himachal Pradesh. It is also rich in flora & fauna and its culture and language is different from other parts of the state. This is the only area in the world where worship in temples has been going uninterrupted and has not been subject to any outside invasion. Close to the border with Tibet, entry to Kinnaur was restricted even for Indian nationals till 1993 and foreigners still have to register themselves with Inner line permit. The Kinnaur Valley is comprised of the lower valley of Spiti and Satluj gorge, two river races through valley The Satluj and The Spiti. Sutlej River has its origin (common to the Indus and Brahmaputra rivers) in Lake Mansarovar beside the holy Mt. Kailash in Tibet. Kinnaur holds three of the world's grand mountain ranges - the Zanskar, the Greater Himalaya and the Dhauladhar, Mount Kinner Kailash (6'050 mtrs) which dominates this region. The circuit around the whole range attracts many adventure enthusiasts every year. The Parikrama or circumambulation begins from Kalpa via Triung valley and back to Kalpa via Sangla valley. The expeditors can drive up to Thangi and the actual trekking begins from here. To reach this forbidden land, India's northern tip, before July, tourists can drive through the Hindustan -Tibet highway, the ancient silk route following the Satluj. The Spiti River then joins the Sutlej from the west and runs parallel with the Great Himalayan Range, the natural boundary between India and Tibet (China). During the month of July, it is possible to enter Spiti from the north, crossing Rohtang Pass (3980m.) into Lahaul and Kumzum La (4550m). In the morning drive to Chail via Chandigarh. On arrival check into hotel. At leisure visit the world's highest cricket Pitch at Chail. Here the vegetation is extremely dense of Deodar & Silver fur forest. In the early 19th century, this place was the Private estate of Maharaja of Patiala. Overnight stay in hotel. On second day, we drive through Kufri, Narkanda and Rampura mainly on metalled roads, through dense forest to reach Kalpa. During this season the fragrance of Apples is enticing and luring enroute. is home to some of the best apple and chilgoza orchards in the world. It also offers a breathtaking panoramic view of the 6000 m high Kinner Kailash range. Overnight in Kalpa. Bon-fire in the evening. Overnight in camp. On fourth day of The Charang Trek/Kinner Kailash Parikrama, we drive to Thangi 2966 m (65kms/3hr). This is the starting point of the trek. Trek to Lambar 2896 m in the Northeast direction ascending the height following the rivulet. Overnight in camp. Next destination of trek is Charang, where we reach after 4 hours of trekking. On this route we walk along the rivulet and natural forests. We camp near the stream. Overnight in camp. We trek uphill in the Charang valley and cover 8 kms in around 6 hours. Lalanti has beautiful meadows with thousands of high altitude flowers. It is a yellow and red vast spread carpet of flowers under an open blue sky with roaring sound of gushing Mountain Rivers adds to the scenic beauty and overall experience. Camp next to stream in Lalanti. We steeply descend to reach Chenab river and then we ascend to reach Bindrabani. On route, we have serene and beautiful views of many virgin peaks, hanging glaciers and towering rocky mountains. Overnight in Bindrabani. we drive through cross country landscape initial part of the drive follows the river bed of the Sutlej river, but as we proceed ahead the unmetalled stretch of road starts winding up amidst the boulders. From the top there are visible some interesting views of the satellite of snow covered peaks. Overnight at camp in Tabo. We visit the Dhankar (3870 m) & Tabo Monasteries (3050 m). Dhankar Gompa is app. 40 Kms from the camp location. It rests high over the valley and is a stupendous example of local architecture. Dhankar is a repository of Buddhist scriptures in the Bhoti script. The Tabo monastery is a thousand years old and second in importance only to the Tholing Gompa in Tibet. This is the largest monastic complex in the Spiti region with several caves adorned with fine frescoes. We drive for 5 hours and visit Ki monastery (4116 m) and Kibber village - one of the highest motorable villages in the world. The locals here offer a nice of blend of Hindu and Buddhist cultures. Ki Gompa is a labyrinth of rooms and corridors and at one time acted as a fort. It houses many valuable Thankas. We drive over Kunzum Pass 4551 m and Rohtang Pass 3978 m. Reach Manali. Check into hotel. Arrival at Delhi by morning. On arrival transfer to hotel for relax. In the evening drive to international airport to catch onwards flight.